Watson turned four months old on Sunday! This may seem like it happened fast and that’s because I posted his three month update over two weeks late. I cannot believe how fast he’s grown and how much he’s changed. I miss when he was a teeny tiny baby, but I’m loving seeing his personality blossom and can’t wait to see him grow into a strong little boy. I’ve realized that being a mom is a big mixture of emotions! By now, he has almost complete head control and he’s rolling over each and every way. He would roll and roll and roll until he was in a totally different room if we’d let him. Sometimes I’ll leave him on his play mat to grab something in another room really quickly and I’ll find him six feet away from his mat when I get back. He is ready to roll! Literally. 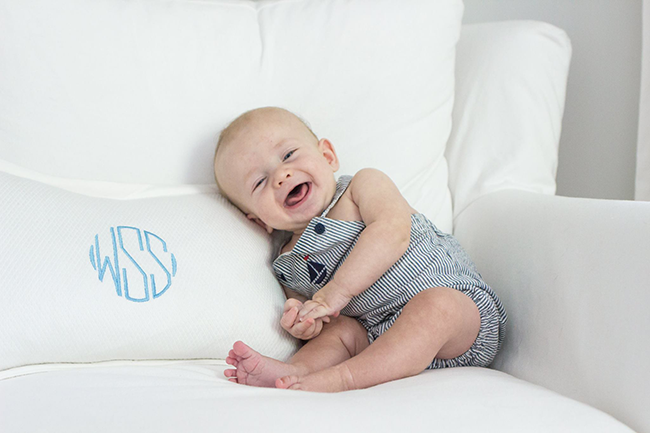 He’s also talking like crazy—and so, so giggly. We lift him up over our heads and say “buzzzzzz” or make other funny noises and he just laughs and laughs. His smile is honestly my favorite thing to see in the entire world! We started using the Fisher Price Rainforest Jumperoo and it’s been a hit. We put a blanket underneath his feet because he’s the slightest bit too short for it. It keeps him entertained for only about 10 minutes or so, but I really think he’ll love it more and more as he gets a little bigger. I think we started using it a liiiittle early—I heard six months is when babies really start loving these? The main reason I love putting him in it now is because it’s great to see him interact with the toys and work on his head, neck, and leg strength all at the same time. Cuddle + Kind. This company, which makes precious knit dolls, is seriously incredible for multiple reasons. First, each doll is handmade, colorful, soft, and unique. 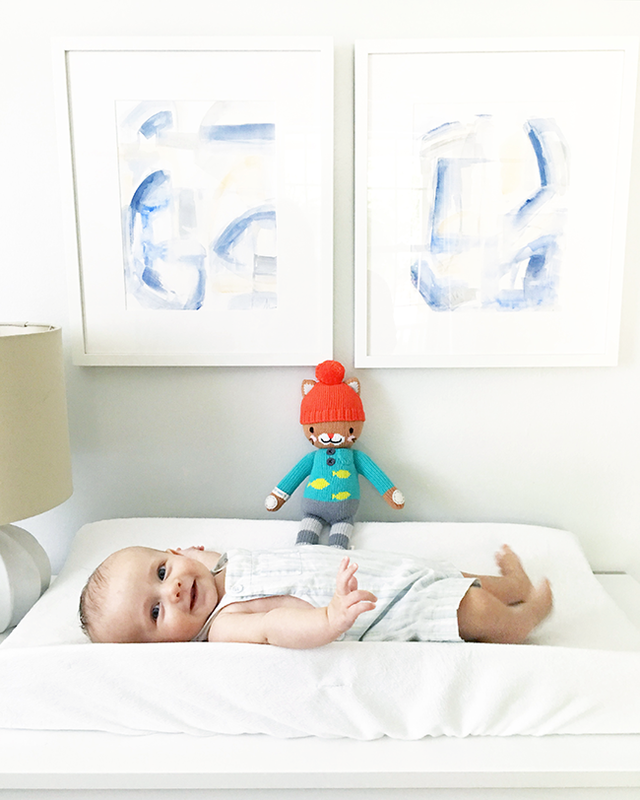 Second, with each doll purchased, Cuddle + Kind provides 10 meals to children in North America and around the world. Watson has Maximus the Cat and he loves him! The little size is perfect for him to hold onto. Target Up & Up Diapers. They’re cheap and hold in the messy diapers just as good as any other diaper we’ve tried. Best of all, they are latex, fragrance and chlorine free, so they are gentle on those sweet baby tushies. This Manhattan Toy Rattle/Teether has been used every day because Watson is at a point where he always wants to be holding something. 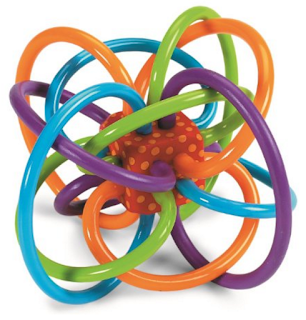 This has pretty colors, makes rattle noises, and is really easy to pick up. He even bites it now because he has started teething. 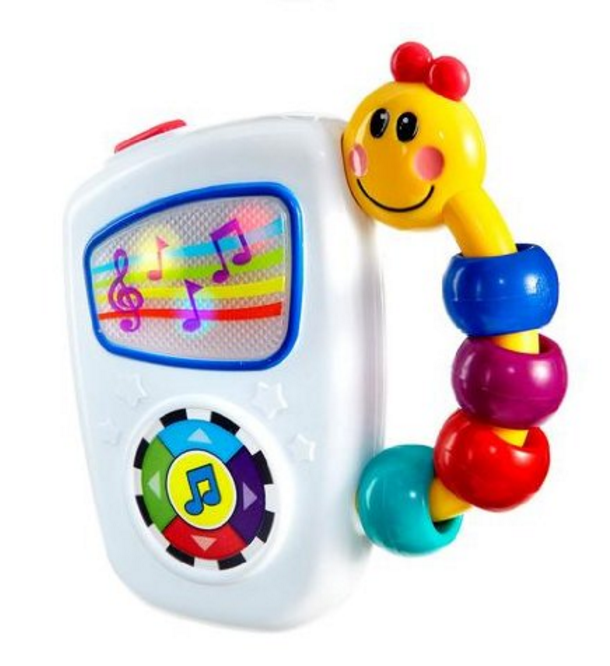 Lastly, I saw that this Baby Einstein Take Along Music Toy was one of the most popular 3-6mo baby toys on Amazon, so I ordered it. This is a diaper bag toy for us. I carry it with me at all times because when he starts to cry out in public, I just pull this thing out and he immediately calms down and becomes entranced by it. It has been a LIFESAVER. Seriously mommas, get this. He is adorable ! 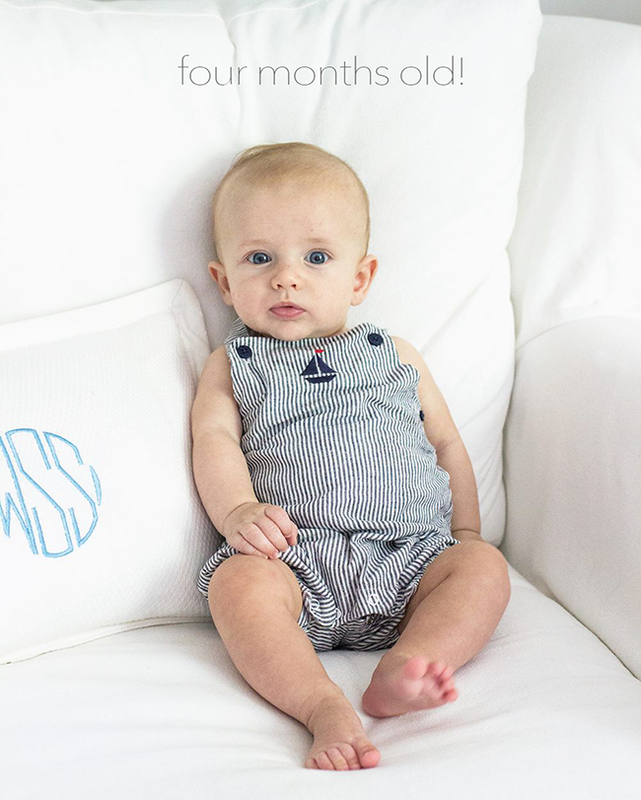 I can hardly get over that he is 4 months ! Where is his cute outfit from? He is so freaking cute!! My little guy is almost 7 months and we got him the same Jumperoo at 4 months and he loved it then but now it's endlessly entertaining for him…and us. 🙂 Besides our rock and play I think it's one of the best purchases we made! Are you still loving your dock a tot? I got one for my 7 week old after reading a million awesome reviews and she doesn't love it 🙁 I'm hoping she will grow into it. Oh no!! Yes, we are still loving ours. I would have hated to have gone without it! I hope your little one starts loving it, too! He's so precious! I love reading his monthly updates, as we're only a month behind you, so it's helpful to see what y'all are going through/doing. Graham loves those two toys as well, I don't leave the house without them. The Lamaze Peek a Boo Forest book is a favorite as well(those crackle-y books). Ohh, thanks for the rec on the Forest book! I saw that on Amazon, too. Graham is SO cute! I'm curious about Up & Up diapers. Do you know how they compare to Pampers? Not sure if you have tried those but I have heard great things about Up & Up ones – I may have to give it a try! At almost 10 months those toys are still some of Oliver's favorites. Especially the Baby Einstein one. Watson is so cute! This is the beginning of so much fun!